Today, the well-known automation web service IFTTT disclosed a big new feature: the ability to create IFTTT recipes on the fly from within a 3rd party smartphone app. Foobot has the privilege to be one of the 14 apps running IFTTT in-app for its launch. At first, it’s not necessarily obvious why this is going to improve things for folks interested in automations, and in our case, Home Automations. Actually, it’s not so much what is new, but rather where it’s new. IFTTT was previously available only through their website and IFTTT app. Now their service is becoming available within their partners’ apps. Why such a move? It’s all about user experience, and easing the process of creating an automation. With this in-app feature, more people will get access to IFTTT and use it. That’s precisely what makes it interesting for us (for you, actually!). Yesterday, in order to, say, send the office air quality values to Slack, or control your Honeywell ventilation based on the Foobot pollution readings, one needed to connect through ifttt.com beforehand. That is assuming that one is aware of IFTTT. Now you can create or use automations on the fly from within the Foobot app, which is full of possibilities considering the dozens of devices present on the platform. “Foobot cares deeply about helping customers make smart decisions about your indoor air quality and this care shines through in every feature they add to their product. We are incredibly excited to work with them on bringing even more value to their customers with the IFTTT Partner Platform. 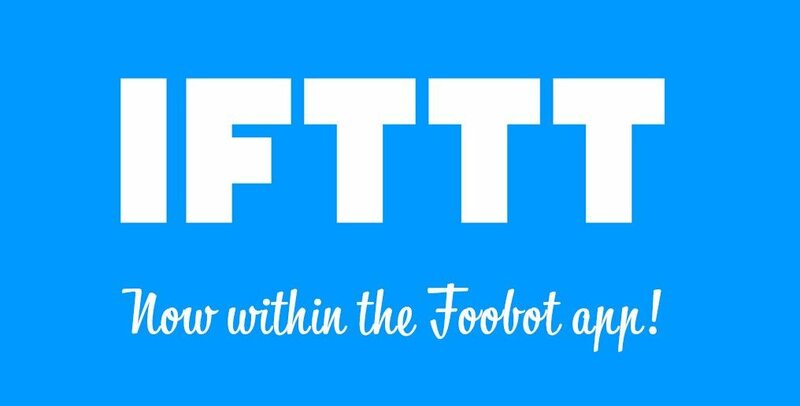 We have had some great feedback since we launched the Foobot channel on IFTTT last April, but we know that not every user is using it. Although some needs could be fulfilled with IFTTT. many people are not aware aware of IFTTT’s service and website. Even though it is not difficult to use, it still presents another learning curve for users to get familiar with recipes, channels, and the other jargon used at IFTTT. Now with in-app, the experience is simpler and uninterrupted. By creating a seamless access to its service, IFTTT makes it easier for our users to set up home automations. At Foobot, we’re excited by this new feature (TechCrunch and Engadget too! ), and can’t wait to see where further developments will go, as it will become smoother and smoother for Fooboters to control other appliances. Grab yourself the latest iOS app update and let us know what you think in the comments below! Some feedback: when clicking on the IFTTT link within the Foobot app, it sends me to the app store rather than the IFTTT app (which I have.) I have an iPhone 5S with the latest versions of both Foobot and IFTTT apps. The triggers claim to be “threshold is crossed”, but they are really “is above/below threshold”. As such, an event gets triggered every 4 minutes or so. While that certainly has application, I would like to see actual threshold change triggers to run an action when the state *changes* from below the threshold to above the threshold, not running again until after it had dipped below the line. Perhaps change the above/below dropbox to have five conditions instead (goes above, stays above, goes below, stays below, or crosses the threshold either way). Also, how about freeform entry for thresholds – the PM actions only go up to 200, but I’d like to set alerts for readings higher than that.